Politician and writer Dr. Shashi Tharoor criticises in his book An Era of Darkness: The British Empire in India the British colonial rule of India and their apologists. We speak to him on the matter. Dr. Tharoor, the same way Willy Brandt once kneeled in Warsaw, you want, say, Prince Charles, to kneel in Amritsar in order to apologize for British colonialism in India. Why? Because the Jallianwala Bagh massacre is in many ways symptomatic of the worst excess of the British Raj in India: 200 years of exploitation, depredation, loot, outright theft, murder, and famine policy that killed people. In Jallianwala Bagh, Colonel Reginald Dyer did not ask protesters what they were doing, did not order them to disperse, did not even fire a warning shot… he just asked the troops to open fire on defenceless unarmed men, women, and children. While some 1,379 people died, others were grievously injured. So when the centenary of this event comes up on the 13 April 2019, it would have a salutary effect of helping cleanse the sin, if a member – ideally of the royal family – were to come and go on bended knee in Amritsar. You do not blame the British Raj for past atrocities alone, but for laying the foundation of modern day conflicts, such as the Hindu-Muslim divide. The policy of divide et imperia goes back to the so-called mutiny, the revolt of 1857-58, in which Indian soldiers, both Hindu and Muslim, rose up against the British overlords and fought side by side to overthrow the colonial rule. The British suppressed them quite ruthlessly, killing over 100.00 people in Delhi alone. But they vowed also to never again allow this to happen. They thought the best to do so was to divide Indians against each other. The policy was undertaken to try and foment a separate consciousness amongst the Muslims and the Hindus. For instance, the creation of the Muslim League as a rival body to the Indian National Congress, founded in 1885, or the British partition of Bengal in 1905. Indeed. The result was that the fomenting of the separate consciousness gathered momentum of its own and created what became inevitably the tragic division of the country into India and Pakistan, i.e. the partition of 1947. Because once the British had done this to this extent, it became impossible for India to be ruled as one. Are there not also “non-British” reasons for the conflict? Will Durant – whom you cite in your book – calls the Muslim conquest of India ‘probably the bloodiest story in history’. That is true in the sense of the early invasions, particularly of Muhammad of Ghazni and Muhammad of Ghori. Also for two later invasions, the invasion of the notorious Timurlane, 1398, and Nadir Shah, 1739. They came, killed, looted, and left. But this is not the case with those who came and stayed. For example, the Mughals, for the most part, were very enlightened rulers. They married Hindu women, so that each generation was more Indian and less, say, from the Fergana Valley. Each successive generation always worked with people of Hindu background as well – whether Hindu generals, ministers, advisers, or courtiers. Is it not too easy to blame the British for everything? About 70 years have passed since independence, but many of the same problems are prevalent. Nothing in the book excuses or justifies our failures in the present. It explains where we started in 1947. But thereafter, every choice we made was ours to make. And though we worked within those constrains, we can justifiably point to some failures and some achievements. Failures such as the negligence of education. Achievements such as India’s science-technological infrastructure. Did not the British Raj also leave behind some of these achievements? The railway system, perhaps? There were many good things left behind, but nothing that was brought in genuinely for the benefit of India. The railways were brought in as a colonial scam. It was a highly profit-making venture for the British. While the railways were entirely built on Indian taxpayer’s money, profits were entirely made by the British investors. They were built only for the purposes of extracting resources from the Indian interior, and taking them to the port to ship them to England. Or to send troops into the interior to quell any disturbances. In other words, whether it was railways, rule of law, the English language, or, of course, education, they were all brought in to enhance British control, further British interests, or increase British profits. …which is also important. Because the colonization of the mind is as crucial as the colonization of the bodies of the people who were ruled. But at the same time, the so-called Orientalists were not in any way, as far as I am concerned, all bad. They may have been motivated, in many ways, by two not-so-positive things. One is part of the project of categorizing, classifying, and understanding the colonized in order to control them better – which is a very common element of the practise. And the second would have been to study the East in order to demonstrate the superiority of the West. These two motivations, notwithstanding, did help resurrect, translate, and preserve a lot of texts that had fallen into disuse, neglect, or had been lost to popular consciousness. Therefore, as an incidental by-product, I am grateful. Where do you want to see India in another 70 years? India, above all, owes a duty to its poor. Because whether we grow at 9% (as it did under my government) or 6% (as we are growing under this government) is ultimately irrelevant. What matters is the 25% at the bottom of the socio-economic pyramid. Until we can ensure, that they have three square meals a day, a roof over their heads, education, decent healthcare, and prospects of a better life than their children, then we would have failed as a society. That does not mean we should stop all our other aspirations, such as our space program or IT. There was a time, in the distant past, when India was the most prosperous country in the world. I am not saying we can ever get back to that. The world is a more equal place. Thanks God for it! But we can certainly be better than where we are today. We have to work for that. Krisha Kops, of German and Indian descent, is a journalist working for publications such as the Süddeutsche Zeitung Magazin, Deutsche Welle, and Times of India. In addition, he is writing his PhD in intercultural philosophy on the modern philosophical interpretations of the Bhagavad Gītā. Dr. Shashi Tharoor is a best-selling and award-winning writer as well as politician, serving as a member of Parliament in Lok Sabha, the House of the People. As a writer, Tharoor has published several works of fiction and non-fiction, such as the Great Indian Novel or Pax Indica: India and the World of the 21st Century. 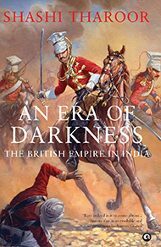 His book An Era of Darkness: The British Empire in India is a corollary to his successful Oxford Union speech.